When organizations are implementing Server Based Computing one of the main reasons is to reduce the costs on the fat clients. One of the possibilities is to rebuild the current fat clients to thin clients using a software solution. Mainly those software products are based on Linux based operating systems which auto starts the ICA session. A possible disadvantage of these products is the knowledge of the IT department about Linux systems and how to support these. If you still would like to use Windows or other Windows Operating System like Windows 9x or even DOS a Norwegian company developed a Thin Client solution which runs on Microsoft Operating Systems. In this review we will take a look at these products called ThinWin and ICADOS. First take a look at ThinWin product. As mentioned above it are two separate products. 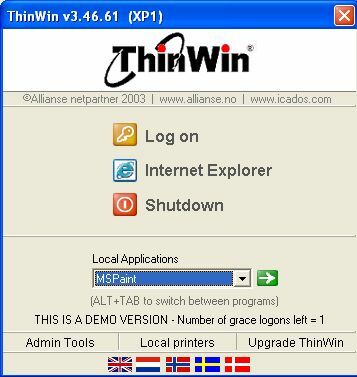 ThinWin for creating Thin Clients based on Windows XP and ICADOS for DOS based clients. 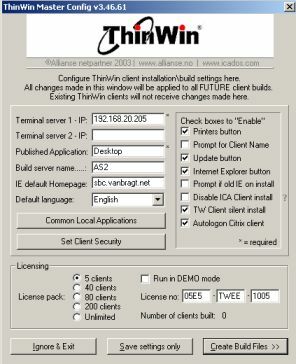 Before you install ThinWin it is important to know that if you would like to use it for Windows 9x or ME workstations the ThinWin "Server" should NOT be a member of Windows domain. If you start the installation of ThinWin you will be warned for this. 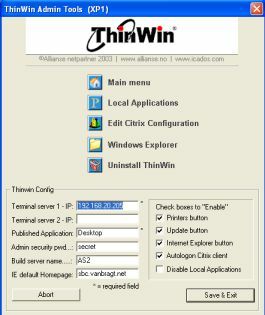 The installation of ThinWin exists of one single executable. Besides the warning the installation would like to know which parts you would like to install and you need to fill in the company data. This information is used to generate an activation code (which will be send to the ThinWin activation Server). After specifying the destination location the program will be installed. After the installation the configuration tool will be automatically launced, but we will discuss this part in the next chapter. When you start the ThinWin Configuration Wizard the configuration window will be displayed. First you can enter you registration code so client can connect to the server. Actually is the configuration pretty simple. You need to specify the IP addresses of the Citrix Presentation Servers and the name of the Published Application that should be started (the starting point of ThinWin is a full Desktop, because you can only configure one Published Application. You could choose to start PNAgent or a Web Interface as default application, which makes it possible to display Published Applications). Following the ThinWin server (running the software) should be specified so the client can update his information. On the right pane you can configure how the client should look like and which options should be available. Think of displaying the Internet Explorer link in the client menu, auto logon, the way of installation of the ThinWin client and the ICA client. With the button Common Local Applications you can add applications that will be started locally on the client. Do not forget to enter a password at the client security. This password enables advanced options and makes part of the client available for usage again (think of Windows Explorer). When you configured all the options to your needs you need to build the client package. This can be saved on disk or network share. From out of this location the clients can be installed. First the software needs to be installed on the workstations. Therefore you need to start "client setup.exe". Because the software does not have a management console (or similar) this is a manual action or you can arrange something using scripting or a third party tool. The installation it selves is without any user interaction. When the installation is finished to machine will auto boot (if configured) and show the ThinWin usermenu. The client will be auto start the configured ICA Published Application. The button Internet Explorer will start the local Internet Explorer. If you configured local applications, the user can select one of those and start it by pressing the green box with the arrow. ThinWin has build in language files for English, Dutch and the Scandinavian languages, where users can easily switch the language of the client by pressing the corresponding flag. When pressing the admin tools component the user can change the screen resolution and enable the remote console for support (based on VNC). As administrator you can enter the admin password in the client and change the advanced settings which are configured during the configuration. Think of changing the ThinWin configuration, configuration of local applications, Citrix configuration or open the Windows explorer to do some maintenance tasks. Don't forget that you should configure the settings for ICA client on the build server , because ThinWin does not show these options to you during the wizard. If you installed (the outdated) Citrix client via ThinWin you should configure those settings into the source directory or install and configure the ICA client via your own preferred method (ThinWin advices to use the automatic client update feature for Citrix, because they tuned and optimized the included version). And how is ICA DOS looking then? Also the installation of ICA DOS is one single executable. The installation has the same look as the ThinWin installation. Only the installation is protected with an installation password, which is displayed to you when you downloaded the software from the website and now activation code needs to be created. Also this installation automatically starts the configuration after finished the installation. Because DOS client cannot connect to a Windows 2003 server, you need to use a Windows 2000 system to deploy this software component on. When you start the ICADOS configuration a wizard will be shown. In this wizard you need to specify your license code first to start with the configuration. During this configuration wizard you need to configure the IP addresses of the CPS servers, the Published Application Name and the client options (encryption level and client mappings). At the end you need to specify how the clients will get their IP address, followed by the creation of the ICADOS boot disk. This is created on a physical disk so you need to have a floppy drive. For DOS clients you need to boot the devices with the created floppy. Unfortunate I do not have any clients available with a floppy anymore so I cannot try this part. The boot disk will build the ICA DOS on the hard disk by detecting the right network adapter and start-up the configuration to start an ICA session. As described one of the advantages of these products is that the operating system is probably more familiar for system administrators without Linux experiences. 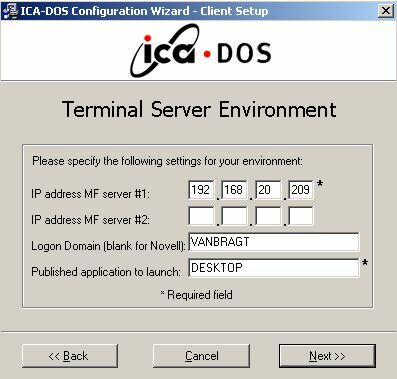 Regarding to the ICADOS product the it will become difficult to have full support this product in your infrastructure. Citrix stopped developing the ICA client for some time now and also Microsoft stopped supporting DOS clients connecting to Windows 2003 systems. Also there are many clients that do not have a floppy disk available for the configuration and there is possibility to use a PXE based starting mechanism. The ThinWin product has some nice features. I think the client part is user friendly (with the multi language support), has a good feature to use local applications and also from an administrator view has some advantages. It is pity that another method (or manual intervention) is needed to install the client and that the product is delivered with an old ICA client version. Also you still need to patch the Windows system with security updates to reduce the risk of vulnerabilities. The biggest advantage of the Linux based products are the central management possibilities those products have in comparison with the ThinWin product. User friendly interface with the option to define local applications. Linux based product offer more central management than ThinWin does.